Dante Chicatell with daughters Sandra and Patricia at the New Canaan YMCA on Nov. 10, 2017 in New Canaan. NEW CANAAN — Everyone who passed by the New Canaan YMCA’s front desk recognized Dante Chicatell and his signature smile. The greeter, who turned 104 Nov. 24 last year, died Wednesday, Feb. 28. Chicatell had joined the YMCA back in 2000, working two days a week. According to his obituary, Chicatell was once honored for being the oldest YMCA employee in the United States. He is survived by his two daughters Sandra Chicatell DeLeo and Patricia Chicatell Wade. For nearly 18 years, Dante’s presence at the YMCA was felt by all. Chicatell’s legacy at the YMCA was cemented when the locale unveiled Dante’s Cafe on the first floor at a birthday celebration Nov. 10 last year. Dozens of people attended the ceremony, including his two daughters. 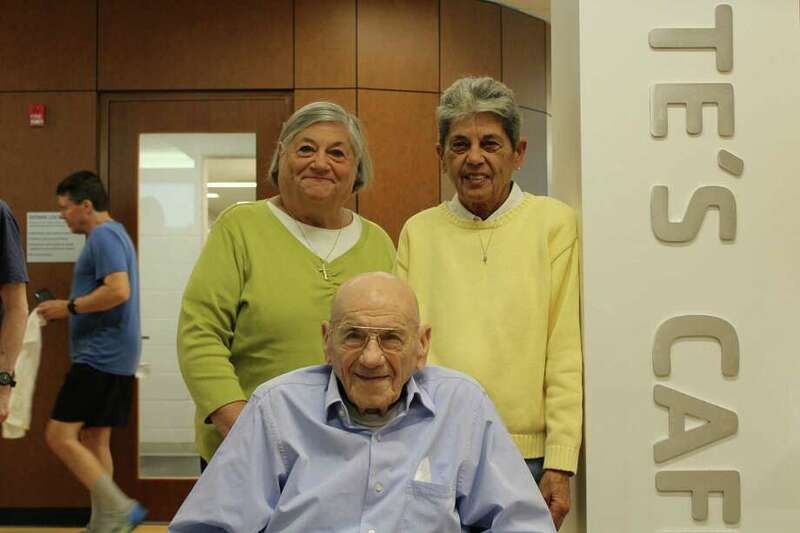 Chicatell was born and raised in Stamford and resided in Darien for the past 63 years. He worked for Stamford-based, technology company Pitney Bowes during World War II where he was involved in the construction of computers for bomb sites. He was a past president and Charter Member of the Darien Piedmont Club, an organization that promotes Italian-American heritage and is engaged within the community. A memorial will be held at the Edward Lawrence Funeral Home at 2119 Post Road in Darien on March 5 from 8:30 a.m. to 9:30 a.m.
A Memorial Mass will follow at 10:00 a.m. March 5 at St. John Church at 1986 Post Road in Darien. In lieu of flowers, Chicatell’s family has reequested that donations be made to the Piedmont Club, 152 Hecker Av., Darien, Conn. 06820 or the New Canaan YMCA, 564 South Ave., New Canaan, Conn. 06840.